We’ve been working mostly on scenes in Mr. Conor’s office for the past couple days. We stayed after school from 9:15 AM to past 2:30PM. If that’s not dedication, I don’t know what is. We decorated his office with intense vines and flowers and very earthy things. It came out amazing. And the costumes…wow. 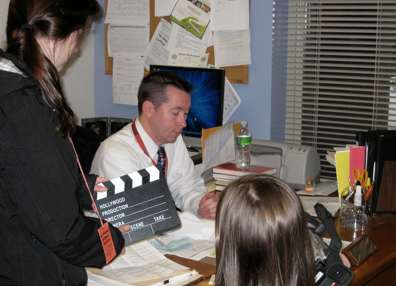 Mr. Conor has been really easy and fun to work with, and we are lucky to have him be apart of our movie. When Emily, Earle, Brian, and I film, Dave has been very helpful with subclipping and editting. Right now on this wicked short day (one hour delay and half day suckahhh), Dave is importing, Emily and Gaffy are editting, and Earle is working on music. Pretty much, we rock.